Union City, CA may not be as famous as its neighboring cities of San Francisco or Oakland, but it does have several key features which set it apart. Once known as Alvarado, the town was the first county seat of Alameda County, though that was soon lost to San Leandro. Its first community was founded in 1850, and became Union City when the communities of Alvarado and Decoto joined together to avoid annexation from Newark, Hayward, and what became Fremont. At Indoor-Restore we can schedule a next day mold inspection and offer 4 samples, laboratory report, and removal recommendations. Though the community prides itself on being small town, it shares two distinctions that make it unique. Union City is the site of the first sugar beet factory in the United States, the California Beet Sugar Company, a California Historical Landmark. Union City is also the site of the Bay Area Flight 93 Memorial in Sugar Mill Landing Park, which commemorates the passengers and crew of the fateful flight that was hijacked and crashed in rural Pennsylvania on Sept. 11, 2001. A small town with a population of 66,869 as of the 2000 census, Union City is like any other close knit community in America. And it has its mold problems like any other. Like much of the Bay, winter is the wettest season, averaging about 2 to 3 inches per month from January through March. This is the most common time for properties to suffer water damage, and when temperatures push the upper 70s come spring and summer, the area is ripe for mold problems. Many residents who suffer from mold issues don’t even know it until a professional mold inspection reveals a problem that has been festering for quite some time. That is why Union City residents and businesses would do well to conduct routine mold testing as a proactive way to prevent damage to their property. Molds can often grow in places invisible to the naked eye, and lurk behind dry wall, within insulation, underneath floorboards, or other hidden locations. Only professional mold testing can really determine if your property is mold free. 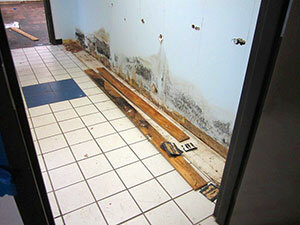 If mold is allowed to fester, the damage can grow to become quite extensive and exorbitantly expensive. Visual mold inspection of entire property & areas of concern. Indoor air quality testing with variable outdoor air quality testing. Surface samples collected for third-party laboratory mold testing. Complete, detailed report of inspector’s notes and lab results. 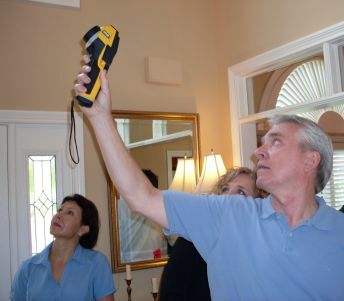 Our mold inspection begins with a full visual inspection of the property, but that’s just the outset. In order to provide a thorough inspection as only science can deliver, our mold inspectors also subject the property to moisture testing with a digital moisture meter. We may also conduct infrared thermal imaging inspection in which we use infrared technology to spot mold and water issues that would otherwise be invisible to the naked eye. Be proactive to protect your health and property by calling the professionals at Indoor-Restore Environmental Services today! Our professional mold technicians conduct fungal inspection of a property, taking samples of suspected mold that are then sent to a third party lab for processing in order to ensure the integrity of the process. Common methods include air sampling in order to spot airborne spores within the environment, as well as surface testing using swab analysis and other methods. Indoor-Restore’s mold inspections will identify the type of molds on your property. We will then provide you a detailed removal estimate based on the inspector’s notes and lab results. In addition to mold testing, we provide a complete solution to your mold problems, from mold remediation to restoration. Following the completion of the mold removal, our services are guaranteed by our industry leading 10 year warranty.